Mr. Manish Shanker Sharma is a senior IPS officer and currently serves as Additional Director General of Police. Mr. Sharma holds a Masters in International Affairs and Public Policy from the University of California specializing in international security & counter terrorism. He has had a diverse experience of 25 years with the Government, having served across 4 continents. 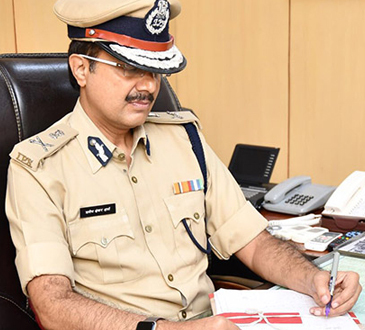 His background incorporates a unique composition of service in the fields of Law Enforcement, Counter Terrorism, Diplomacy, UN Peacekeeping in Europe and ensuring Transportation Security in India. Manish Shanker is also one of the very few experts in India who combine extensive international and national field level experience alongside outstanding international acclaim in combination with academic and scholarly work. Mr. Sharma was conferred with an extraordinary distinction by the Mayor of San Diego, USA who issued an official Proclamation declaring July 20, 2015 as the "Manish S. Sharma” Day to honor his contribution towards enhancing the US-India relationship. He also is the recipient of other rare honours including"The Certificate of Special Congressional Recognition” from the US House of Representatives and the prestigious “National Law Day Award 2016” from the former President of India. Mr. Sharma currently serves on the Board of Directors of the World Affairs Council of San Diegoand has been invited to speak at a number of international events on various subjects across the globe and in India. While in the USA he was invited to speak at the University of San Diego, University of California San Diego, The Osher Institute, US Foreign Services Retirees Association and other platforms. In India he has beeninvited to speak at the country’s largest ever gathering on Counter Terrorism inaugurated by the President of India, at the Megacities Security Conference in Bombay, Aligarh Muslim University, Manipal University, at the International Jurists Council, London ‘s conference on international terrorism in Mumbai and numerous other places. Throughout his extensive distinguished career, Sharma has received numerous Medals and Awards for his outstanding services from the Government of India, The United Nations Peace Medal, Government of USA, Government of Bosnia and Herzegovina, and various other civil society organisations and other dignitaries in recognition of his exemplary leadership, community engagement, tremendous ability in enhancing bilateral relations, courage, bravery and humility. Furthermore, he has served on various committees and panels including those on Counter Terrorism, AVSEC manual group etc. His past assignments include service as IG Intelligence, IG Railways, Director for Indian Ministry of Commerce, Dubai responsible for 22 countries, Director Security, Airports Authority of India and as chief of police in various districts, besides the UN Peacekeeping Force in Bosnia. Mr. Sharma has also served on the Editorial Advisory Boards of the magazine Aviation Security International London and of various educational institutions. Recently Mr Sharma’s latest article on Terrorism titled “Social Media, Technology and Terrorism” was picked up for publishing alongside those of illustrious luminaries in one of India’s foremost works on countering violent extremism –“Global Terrorism: Challenges and Policy Options”. The book is a compilation of views and articles by topmost leaders, scholars and practitioners of the world and India, including the President of India, CEO of Afghanistan, Ministers from Iran, Bangladesh and Malaysia, Home Minster of India and others. Sharma has dealt with in detail the various ways terror organisations use the social Media and Technology and suggested remedies for addressing the relevant issues. Mr Sharma has been featured and covered in various magazines and newspapers across the Globe and in India.